It’s just a couple of minutes before 6 o’clock on a recent June evening, the shadows just beginning to grow long on the pavement and still 99 degrees outside, and 18-year-old Kyle Catarata is on a mission. 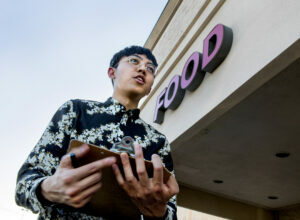 The recent high school graduate, dressed neatly in a floral, long-sleeved button down shirt and slacks, paces up and down the aisles of cars in the parking lot of the Smith’s at Decatur and Desert Inn, clipboard in hand. It’s his first week of freedom and, instead of doing whatever your average graduate might be doing with his or her newfound adulthood, Catarata has decided to spend it registering voters with the Nevada State Democratic Party. And the party needs — and wants — all the help it can get ahead of the 2018 election. Its strategy is simple, and one it has relied on for years as the vaunted Reid machine: Activate volunteers, old and new; use those volunteers to build a longer voter registration list than the Republicans; and then turn out that list, in addition to trying to persuade some of the voters in the middle. “It’s very simple, but it really doesn’t need to be more complex than that,” said Alana Mounce, the party’s executive director. Catarata is one of those newly activated volunteers. He approaches a group in the parking lot. Yes, they say, and walk away. The field organizer he’s working with, Jose Monsivais, is having about the same luck. He approaches one man, who tells him that he’s already registered to vote but thanks him for the work he’s doing. He spies a family loading into their car and switches to Spanish to speak with them, but they demur, too. “It’s tough out here, but you’ve got to do what you’ve got to do,” says Catarata, a smile on his face and seemingly not at all discouraged. Catarata planned a voter registration drive at his high school for a project and registered 70 seniors and also organized a March For Our Lives event at his school. When the school year ended, his brother, who is active in politics at UNLV, encouraged Catarata to apply to the party’s fellowship program. After about 45 minutes, Catarata finally approaches one woman who wants to register to vote. He guides her through filling out the form — where to fill out her birthdate, where to put her driver’s license number — smiling broadly all the while. “I finally got one,” Catarata says afterwards, elated. 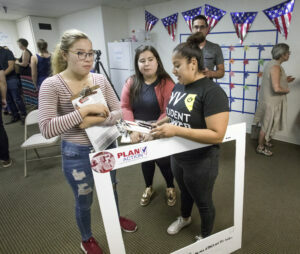 Sometimes organizers target grocery stores in certain neighborhoods for voter registration, as they were this particular evening, Monsivais said. Other times they blanket canvass a neighborhood trying to get people to register to vote at the door. But no matter the method, the ultimate goal for Democrats is to build up a sizeable voter registration advantage over Republicans before November. Mounce noted that even Republican U.S. Sen. Dean Heller has talked about the importance of the voter registration gap to his re-election bid. Heller, in audio obtained by the Las Vegas Review-Journal in April, said that if Republicans can get the voter registration gap below 50,000, he couldn’t lose. Since the party brought on three paid field organizers in March, the voter registration gap between Democrats and Republicans has slowly started to widen — from 59,084 in March to 61,629 in April to 62,901 at the close of registration in May. “It’s like, one month, okay, two months, but three months is a trend and we feel confident and comfortable that we’re going to continue that trend,” Mounce said. Peter Mellinger — the party’s coordinated campaign director, meaning he oversees coordination between various campaigns and the state party — said the party hasn’t yet determined what that margin going into November needs to be yet. At some point, the party will have to make the call of when to shift its operations from voter registration to focusing on turning out voters, he said. But Democrats are looking to their successes in 2016 — in which the party won the U.S. Senate seat, two competitive congressional seats and control of both houses of the Legislature — as a model for success and taking 2014, which was a red wave year, as a cautionary tale. In 2016, Democrats had an 88,818-person advantage compared to only a 62,036-person margin in 2014. Democratic voters historically don’t turn out to the polls in as high of numbers as Republicans do, which is why winning an election takes some combination of simply having a larger pool of Democrats who might possibly turn out and then encouraging them to do so. Mellinger said that 82 percent of Republicans and 77 percent of Democrats turned out in Clark County in 2016, but Democrats still won the county by 95,000 votes because of their voter registration advantage; in 2014, Republicans turned out at 57 percent and Democrats turned out at 41 percent, which meant they only won the county by a couple of thousand votes. Looking at the state as a whole, the party is focused on consolidating and turning out support in blue Clark County, fighting for every vote they can in purple Washoe County and holding the line in the red, rural counties. Mellinger said that the party had held an organizing event in every state Senate district by the end of April and is on track to holding one in every state Assembly district by the end of June. “That’s really important to us because we want to make sure anywhere in Nevada there are voters there are also volunteers to turn those voters out,” Mellinger said. The party has been focused on reactivating the network of volunteers it has built up in past years through hosting house parties and volunteer reunions in addition to its typical voter registration launches and phone bank efforts. Mellinger said that where it once took an organizer an average of 107.9 phone calls to get one volunteer to do one shift, it now takes them only 19.8. 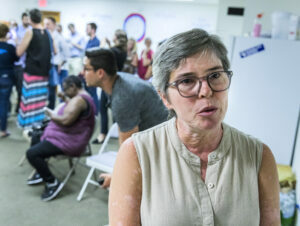 Liz Finkelstein, a 60-year-old former high school teacher, said at a recent voter registration launch that she has been a lifelong Democrat but she decided to get involved with the party during the 2016 election specifically to campaign against President Donald Trump. Now, focused on the 2018 election, Finkelstein said that she sees more enthusiasm on the ground. She said that her fellow Democrats are “horrified by the tone coming out of the White House,” but also concerned about issues such as gun control and health care. But even her neighbors in conservative Summerlin are talking more about the issues, frustrated by the polarization in Washington, she said. Mellinger also said that the party has been getting new volunteers that were previously involved in a local Indivisible group or Our Revolution and even finding fellows, like Catarata, who reach out to the party on their own wanting to get involved. One woman Monsivais met while out trying to register voters even expressed an interest in volunteering with the party. The woman, 53-year-old Erica Lewis, said that she “walked the Barack Obama campaign like it was nobody’s business” but wasn’t really that excited about Hillary Clinton’s 2016 presidential campaign. “I should’ve done phone banking,” she said, a note of regret in her voice. In Clark County, the party is also focused on reaching out into diverse communities and helping key constituency groups, including the Asian American and Pacific Islander (AAPI), Latino and black communities, organize. (The AAPI community makes up about 9.5 percent of Nevada’s population, the Latino community makes up 28.5 percent and the black community makes up 9.6 percent, according to census data.) Mellinger said the party recently held an AAPI power summit that brought together community leaders and experts to talk about best practices for organizing. The party is planning to hold similar events with the Latino and black communities with the ultimate goal of building long-term relationships, not just cycle to cycle ones, Mounce said. She also said that 36 percent of the party’s staff speaks Spanish and two staff members speak Tagalog, which can help build those relationships face to face. 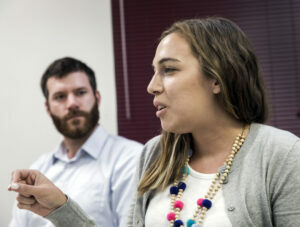 Most of the party’s staff will be in Clark and Washoe counties, but Democrats are also looking to how to boost their rural outreach. Last weekend, several of the candidates running for statewide office went on a short rural tour, and the party is also looking to how it can support down ballot candidates running in races where a Democrat has never seriously tried to run before. Democratic Party staff say that the organization they’re running today is still the same at its core as it was when it was officially under U.S. Sen. Harry Reid’s tutelage and known as the Reid machine. Reid, 78, retired from a nearly five decade-long political career, which included 30 years in Congress, in 2016 and recently underwent surgery for pancreatic cancer. She said the party has also gotten creative with its fundraising, relying on a fundraising council of dedicated donors to help direct its efforts and build relationships while also trying to boost its grassroots donor base. Mounce said that the party has grown its email list two times over and that its average contribution is $17. But the party also recently received a significant chunk of change. Mounce noted the recent $250,000 donation to the party by Democratic donor Stephen Cloobeck, saying that Cloobeck has trusted the party to “do good by him and spend his resources wisely to win in November.” She said that staff “pretty regularly” reach out to all key supporters to ask for their advice and expertise. Also, the former Reid machine isn’t entirely Reid-less. Mounce said that Reid talks with the party’s chairman, Assemblyman Will McCurdy, on the phone just to touch base on what the party is doing and how he can be helpful. 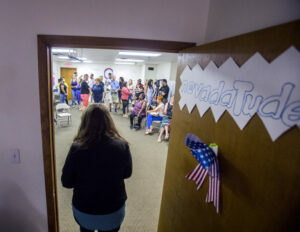 Reid even visited the party’s headquarters in mid-March to talk with staff and share his personal story. “He’s really curious about how races are going and providing political advice on the work that we’re doing,” Mounce said. The road to 2018 is long, but the Democrats are optimistic. They’re encouraged by the number of Democrats who have turned out to early vote so far and say that it speaks to the enthusiasm of voters. “It’s frustration on a national level. But I’ll tell you, if you go to Washoe County, I also think it’s frustration on a local and state level as well,” said Mounce, pointing to the recall attempts targeting Democratic state senators and concern about who will be the next governor and U.S. senator as the main motivating factors for Democrats. The party has planned its first canvass for the weekend after the primary and is planning on having a minimum of 72 launches over the weekend across the state, most of them lead by volunteers. It also plans to host statewide volunteer summits in conjunction with the National Democratic Training Committee, and the Democratic National Committee plans to host a big regional training in Nevada as well. Mounce said the DNC has been an “incredible partner” through the recalls and in the party’s voter registration work, supporting them with a six-figure investment. “They’ve been really helpful in growing our efforts and getting our coordinated campaign really humming at a higher level,” Mounce said. The Republican Party has recently been stepping up its ground game, too, trying to emulate the successes of President Barack Obama’s 2008 and 2012 campaigns by building a volunteer network and compiling a robust data warehouse. But Mounce said that doesn’t worry her. Disclosure: Stephen Cloobeck has donated to The Nevada Independent. You can see a full list of donors here.